A pivotal character in the tragic story of the ill-fated Donner Party was Lansford W. Hastings. He was a twenty-seven-year-old lawyer from Ohio when he journeyed to Oregon and then later to California in 1843-44. At the time Hastings visits California, the territory belonged to Mexico. When he returned to the U.S. in 1844, he had grandiose visions of wresting California from Mexico, making it an entity to be called the Republic of California, with himself holding a high office. His methodology for accomplishing this endeavor was to overwhelm the land with emigrants, and to this end, he authored a book titled The Emigrants Guide to Oregon and California. In this booklet, he made a one-line statement that became the trigger for the struggles of the Donner Party. This suggestion of an alternate route became known as the Hastings Cutoff, even though Hastings himself had never traveled this route before making it a part of his emigrant’s guide. George Donner had a copy of Hastings' emigrant guide and concluded that he would take the route, as he had been assured it would cut off 350 to 400 miles from the entire journey. Likewise, knowing that his group was at the back of the pack of emigrant trains that year, heading to Oregon and California, he was concerned about completing the journey before the snow began to fall. Somewhere beyond Fort Bridger, Wyoming, the regular trail to Oregon continued west-northwest past Fort Hall, Idaho, but here the Hastings Cutoff split from the main trail and headed west – southwest to enter Utah near the present day Evanston, Wyoming/Utah border. From the bottom of Echo Canyon in Utah (present location of Interstate I-80), the Donner Party had to blaze a trail over the Wasatch Mountains down to the valley of the Great Salt Lake. They lost valuable time building this wagon road across the mountains, but on a bright note, it was of great value to the Mormon pioneers who followed this road one year later in 1847 on their exodus from Nauvoo, Illinois, to the Great Salt Lake Basin. Skirting around the southern end of the Great Salt Lake, the Donner Party then entered the great salt desert around Grantsville, Utah. This turned out to be an eighty-mile trek through mud and muck that saw the heavily loaded wagons sink into the mud up to the hubs of the wagons. It took six days to cross this extremely inhospitable desert; water ran out after three days, and many of their animals bolted, crazed by thirst. A number of wagons were abandoned. As a side note, as late as the 1930s, the wagon tracks and remains of the abandoned wagons could still be seen in the desert salt and mud wasteland. These delays cost the Donner Party their opportunity to cross the mountains, specifically Donner Pass, to the safety of the lowland ranches on the western side of the Sierra Nevada Mountains. In spite of their heroic efforts to make miles, they missed crossing the pass by only one day before the deep snows forced them to retreat to Donner Lake and set up camp to wait out the winter. The fate of the Donner Party sends a strong message to Pacific Crest Trail thru-hikers – don’t dally along the way, stay focused on the goal, and plan on making it to the Canadian border sooner rather than later before early September snows have a chance to close down the trail, as it did this year. 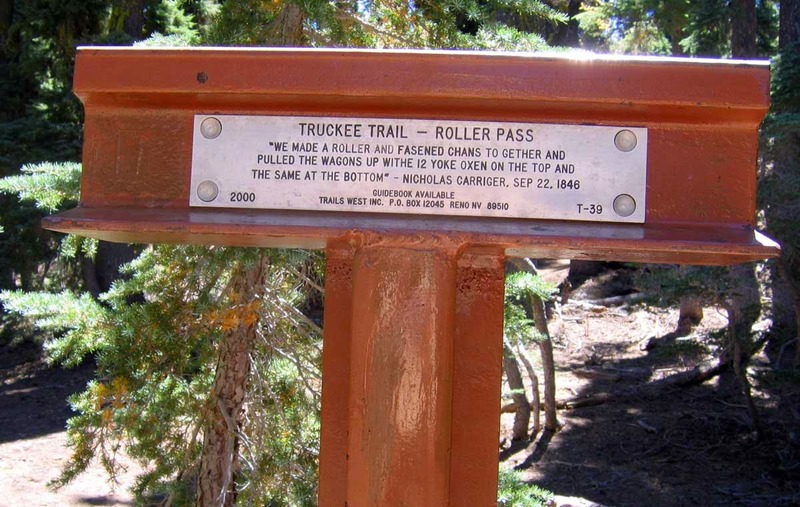 The historical marker at the trail junction of the PCT and Roller Pass.